Chrichton's World: Review X-Men: Days Of Future Past Rogue Cut (2014): Worth it? No, I don't think so. It doesn't add anything significant to the original. 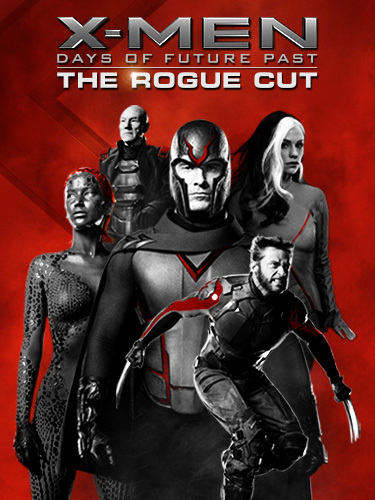 Review X-Men: Days Of Future Past Rogue Cut (2014): Worth it? No, I don't think so. It doesn't add anything significant to the original. Before you dive into this article I ask you to read my review of the original X-Men: Days of Future Past. Whenever there is a new version released of an original movie it does peek my interest to see if it really offers something different or better and if it is worth to watch or to purchase. In my review of the original you can read what I thought needed improving on and in a way this cut appears to be tackling these. To be honest I am not sure if this extended version truly makes a significant change. Most of the changes are subtle and there are only two scenes that stood out to me. There is one extra scene between Mystique and Beast and a couple of scenes more of the future where Magneto's part is increased which does give us a heartbreaking sequence involving Iceman. But what about Rogue herself? She barely speaks or interacts with others. If you don't know anything about her it would make you wonder why she was there. Why call it a Rogue cut and then still make her role seem trivial? Other than what I mentioned above there were no changes. Upon re watching X-Men: Days of Future Past again I realize that it's a good film that delivers in many ways but does deserve far more to truly make it worth your while. Why introduce him and then to only use him so briefly. He easily could have made the difference and perhaps could have made it possible to give us more either story wise or action wise. One of the highlights in the film if not THE highlight. - More of the Future. We already know enough of the past and the present since most previous films in the franchise were focused on that then why not give us more of the future and the heroes of this future. - Less of Charles Xavier struggles. I don't like emo Xavier. The Xavier I know from the comic books wasn't a cry baby. And while I understand this take as a plot device to tie up the events of X-Men: The First Class with this one I do think it takes too long for him to get a grip of himself. - More action and spectacle. To be clear, I loved the acting and the performances of all the actors. It is good that it is present in blockbuster films. However I would have liked to see that combined with the action and spectacle that the X-Men are known for (especially in the comic books). You have to show why humans are afraid of the mutants. Magneto even tells this in his speech at the end. Only it made me scratch my head because apart from what we see in this film we know that the mutants are far more powerful than portrayed. - More Logan / Wolverine. His role in this film is pivotal but he does not get a whole lot to do. Talk about underusing such a rich and complex character. Oh no he didn't. I know that for a lot of people Jennifer Lawrence can do no wrong. And to an extent I agree. However I think Mystique in the films has always been given far more importance than she actually deserves. With all those other more interesting mutants around it is puzzling why they keep on insisting on her prominence. - More and better adapting of comic book verse. The X-Men comics and all the spin offs are rich of wonderful and amazing stories, characterizations and action. You just have to pick one of them and try to recreate them to the screen as faithfully as possible. The refusal of Hollywood to do this is downright infuriating. So what do I think of this Rogue Cut? I don't think this one warrants a purchase or rental since it hardly adds to the overall experience. In doesn't change or improve anything significant. It does not even attempt to do real new things that could have made it fun to go back and forth between the original and this cut. From my point of view this is just another cash grab.